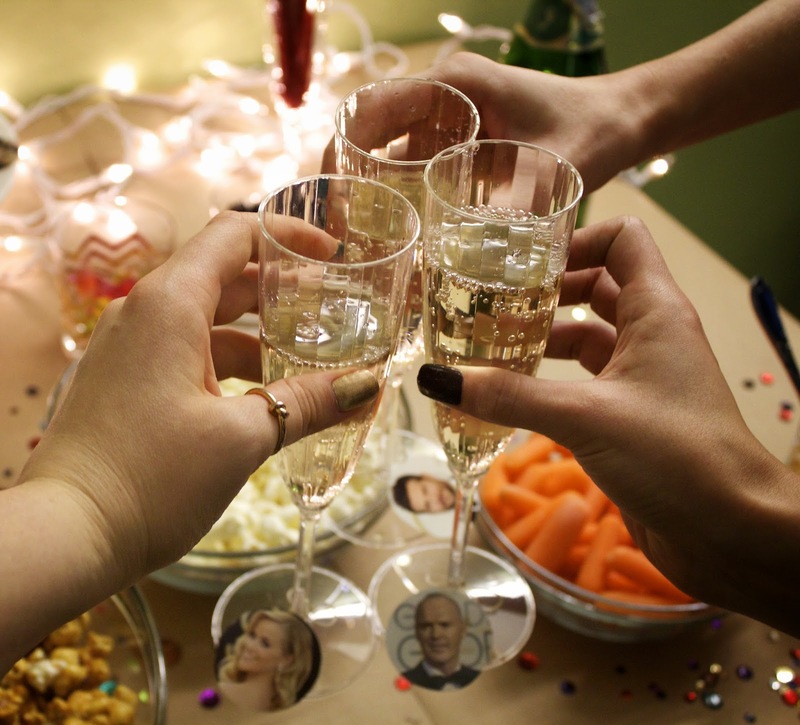 There's nothing like throwing together a last minute party, am I right? While having a small Oscars party has been on my mind for a while, that doesn't mean I actually did anything about it until yesterday morning. 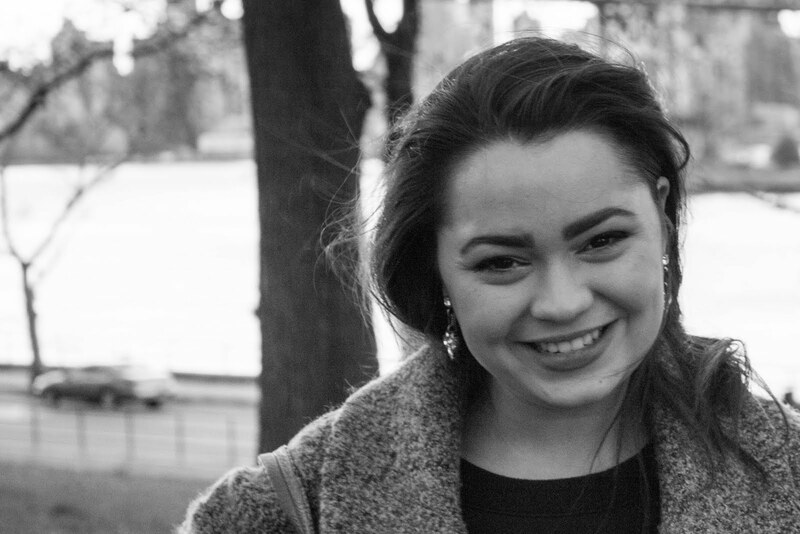 That's when I pulled myself together and started prepping the adorable party I could see in my mind and had promised my roommates. 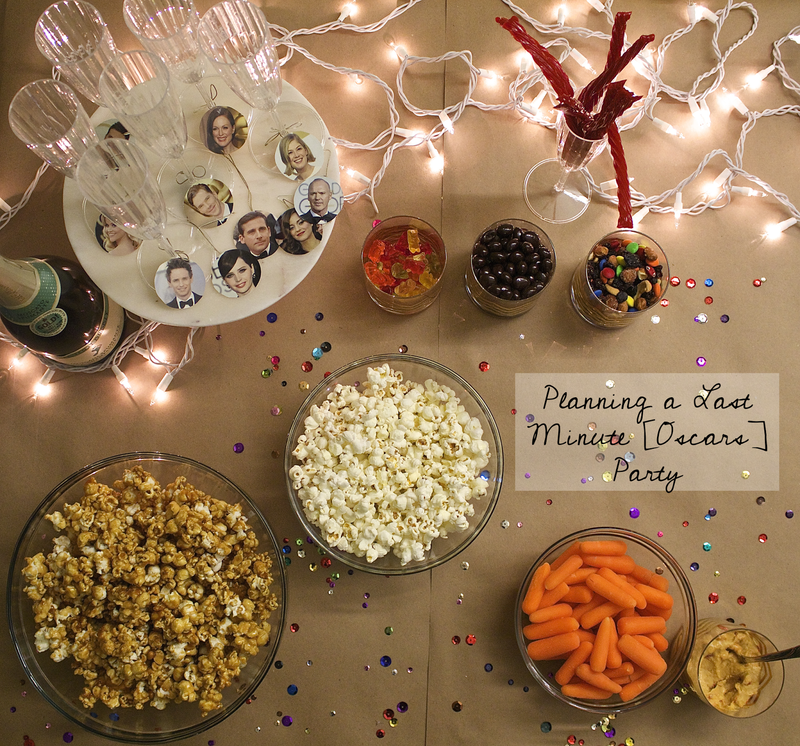 The menu included classic salted popcorn, caramel corn, carrots with hummus, gummy bears, chocolate covered raisins, trail mix, Twizzlers and champagne, of course. 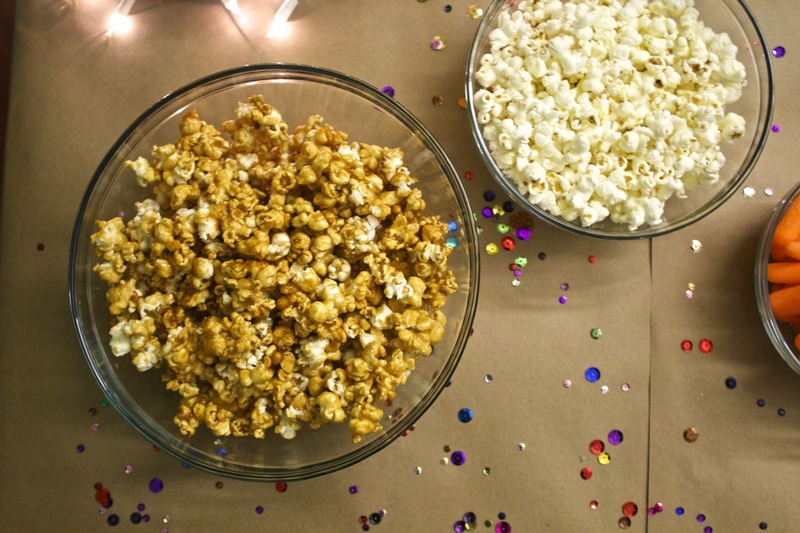 Basically all of the award show essentials, because there's really nothing better than judging celebrity dresses while eating caramel corn in sweatpants. 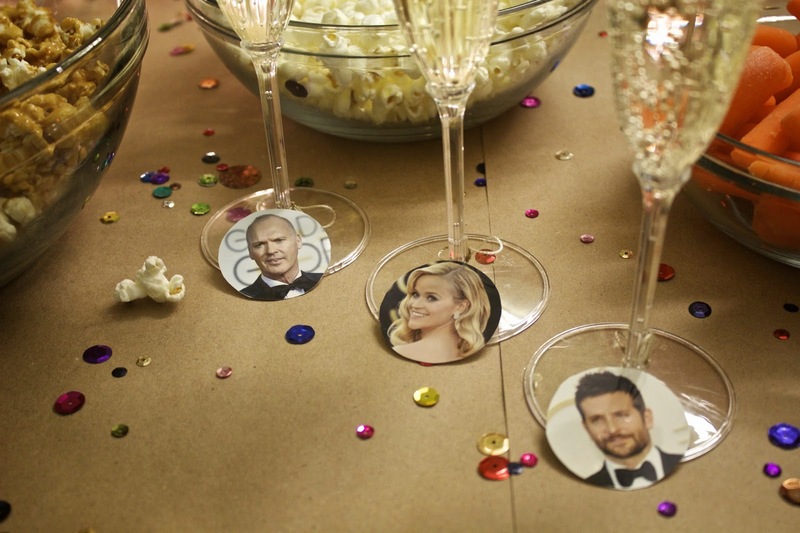 For a fun twist, I made little drink tags with all of the best actor and actress nominees. Instead of ballots, everyone chose their drink tag base on their prediction. I was personally routing for Reese Witherspoon and Benedict Cumberbatch. Although, Eddie Redmayne is just so adorable that I couldn't even be upset. As soon as I opened this bottle, the cork ricocheted off of the ceiling and shot back to the table. 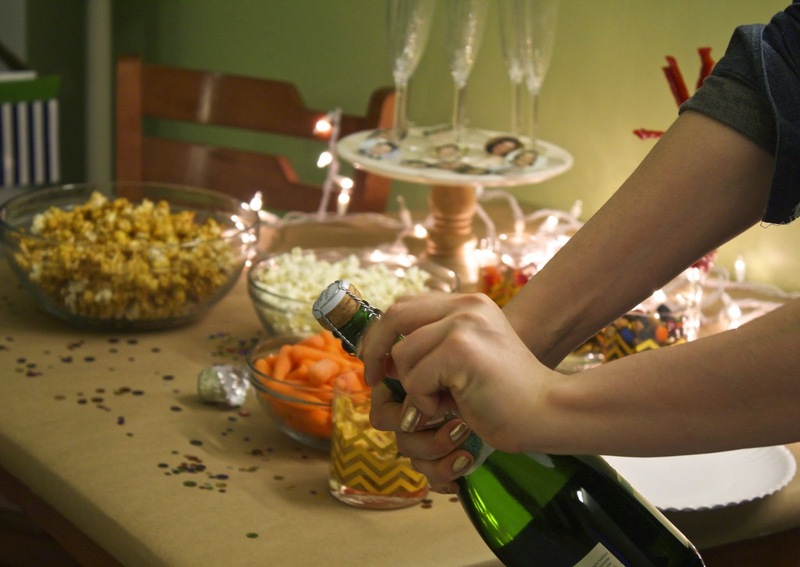 This is exactly why opening champagne gives me anxiety. Our predictions all ended up being incorrect, except for my roommate Julie, who came a little later and chose Eddie for her drink tag. 1. Work with What you Have. First, decide on a look you want and use what you already own that works. 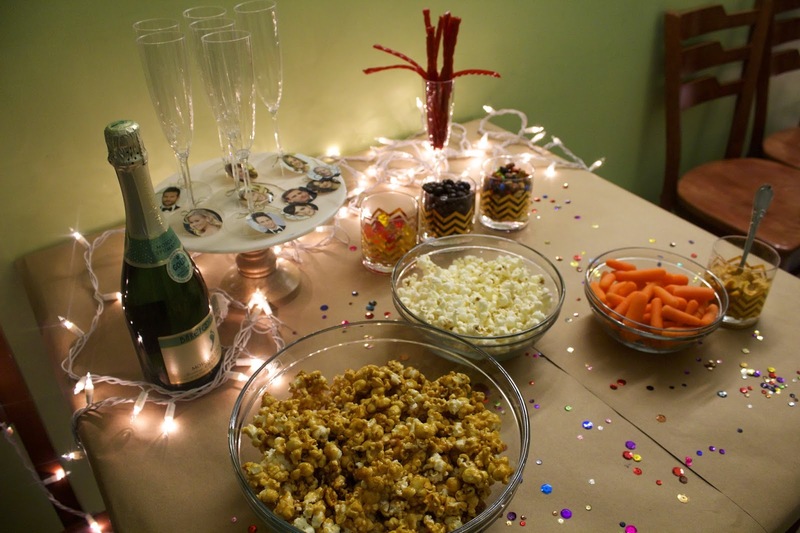 I pictured my Oscars table with a relatively simple spread. I wanted warm tones, pops of color and a hint of glamour. Once I knew this, I was able to do a mental inventory of what I already had that would match. 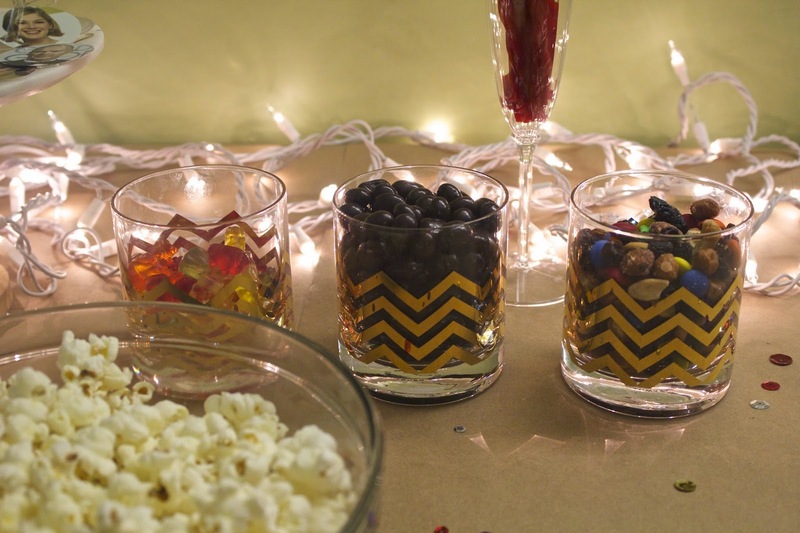 I already had the brown packing paper, the gold chevron glasses, the cake stand, and white twinkle lights. I even had the rainbow sequins in a desk drawer (typical, I know). 2. Buy Only the Essentials. Once you know what you already have, you'll probably still need a few things at the store. My best advice is, "don't go overboard." As a college student, I'm always pretty budget conscious, and most of what I plan to spend for a party like this gets spent on food. In terms of food, think about budget friendly crowd pleasers. When planning a menu, try to pick recipes with ingredients you already have on hand. It'll save you money and make your life that much easier. 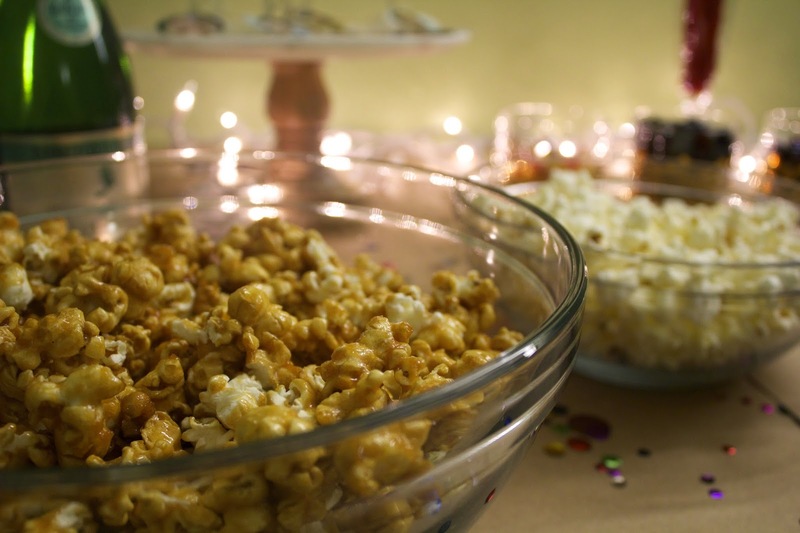 Obsessed, as I am, with baking, I already had almost everything I needed to make caramel corn, which made it the perfect choice. 3. 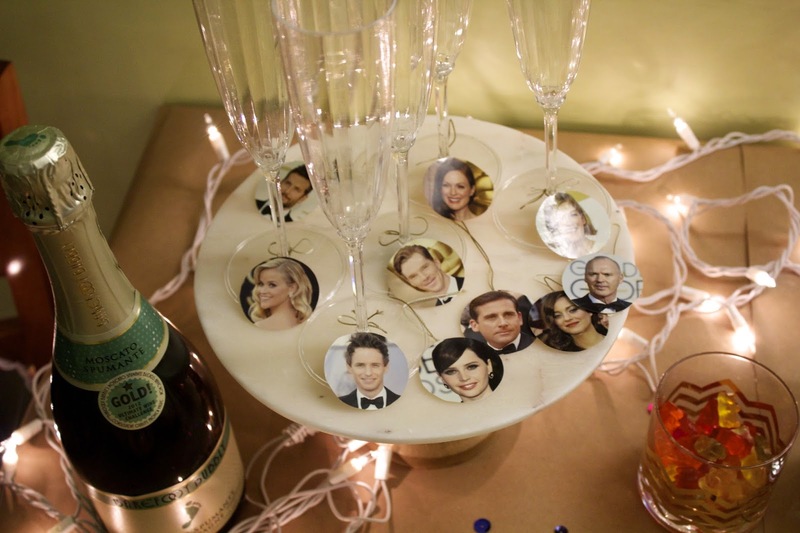 Small Details Make the Difference Think of cute little ideas that will make your party stand out. These are the things that people will remember. The Oscar drink tags were an idea I had last week, and although super simple to make (same day printing at Walgreens plus some string and a hot glue gun), everyone loved the fun detail. So get planning! Or, you know, don't and just wait until the day of.